Pen-and-ink plan of Cave 6 at Aurangabad by Ganpat Purshotam (fl. 1875), dated March 1876. This image is from an album of 106 drawings of plans, sections, elevations, sculpture and architectural details from sites in Hyderabad and Bombay. The drawings were prepared mainly by Indian draftsmen under the supervision of James Burgess of the Archaeological Survey of India. Situated at a height of 700 feet in the Sahyadri range of the Western Ghats two miles to the north of the town of Aurangabad are a series of Buddhist cave temples carved into the mountainside. They are arranged in two main groups approximately a third of a mile apart. All, except number 4, are attributed to the period of the Vakataka (fourth and fifth centuries AD) and Kalachuri (sixth to eighth centuries) dynasties. There was probably a long and continuous occupation of the site by Buddhist monks and their lay supporters. Cave 6 dates from the 6th century. 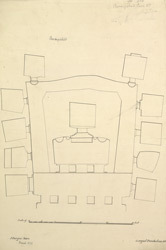 Along with caves 2 and 7 the basic ground plan of Cave 6 is of a circumambulatory path around a square shrine housing the Buddha who sits on an elaborate lion throne. In the circumambulation ritual devotees move in a clockwise direction around a stupa or temple sanctuary to perform an act of worship. In the sanctuary is a figure of Buddha in teaching aspect surrounded by kneeling devotees. At either side of the sanctuary door are Bodhisattva figures with attendants and flying celestials. Small shrines are found in the surrounding passageways. The ceiling displays traces of painted circles, peacocks and human couples in blue, peach and white, hinting at what the cave must have been like in its original form.